This is one of those outfits that just falls together perfectly on its own :) I picked this skirt out from Sugarlips not knowing what to wear it with exactly, but when it arrived, along with my new kimono (did you notice the skulls in the lace?) from Forward To All, the two pieces seemed to harmonize, as cheesy as that sounds! In line with the romantic feel of the look, I paired the skirt with a top that had a sweetheart neckline. 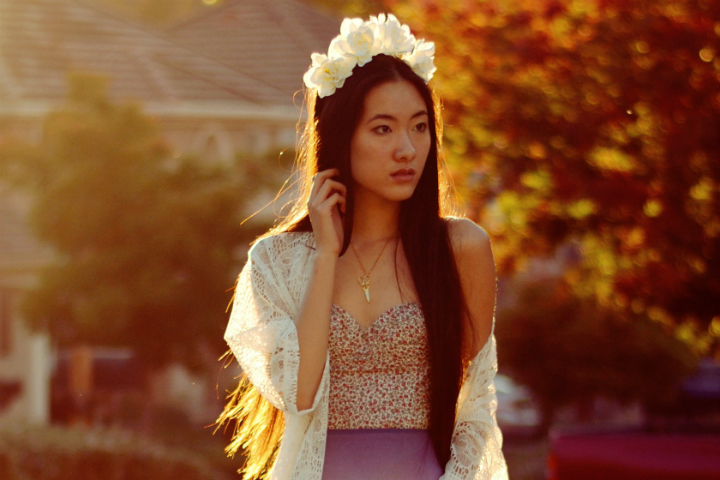 This outfit needed some type of headpiece so I made another floral crown with giant white flowers. It couldn't hurt to throw on my new favorite necklace either! For shoes, I wore my Jeffrey Campbell platform sandals that I bought at Urban Outfitters for only $45; I'm quite proud of this particular find. check out my outfit and learn how to bring a lace dress into fall! check out my post on falls favorite trend: burgundy! wow this outfit is completely STUNNING!! Congrats on your collab! This outfit is so unique, I love it! I am simply in love. What are you? An angel? A magical unicorn? I am so in love. I love this look, so chic ! gorgeous outfit you look beautiful! that ombre skirt is just so amazing. wow. gorgeous purple color. and that skull lace kimono is so crazy unique! love it!